To explore a new de-colonial option for the global future, this article grapples with three movements of our time: the ‘Open Science’ movement, the 1955 African-Asian conference and the Non-Aligned Movement, and the post-exilic prophetic movement of the Abrahamic religions. It explores an alternative intellectual project which will facilitate new research agendas and publication directions that will simultaneously speaks to the three wider audience of the present-day world: the sciences, the Global South and the Abrahamic religious traditions. My objective is to delineate a theological, geopolitical and anthropological exposition as an ethical anchorage for the present Bandung project to steadily move towards the Open Science era. I will argue for Ezekiel’s prophetic model as a plausible de-colonial option for crafting the transnational open knowledge space. As one of the leading prophetic figures in the post-exilic movement of the Abrahamic religions (Judaism, Christianity and Islam), Ezekiel’s vividly detailed vision depicting the four angelic powers and God’s unparalleled majesty is still relevant for today’s topic of discussion. As a captive of an ancient form of pre-modern colonialism—the Babylonian Empire, Ezekiel was only called to be a prophet along the Chebar river of Babylon after Jerusalem was captured by King Nebuchadnezzar when the Israelis were deported in 597 BC. Ezekiel was perhaps the first prophet to receive the call to prophesy outside the Holy Land. This resulted in his prophesies still speaking meaningfully to the post-colonial realm of aliens and strangers of this world—who are conscious about the spiritual and global-structural reality that they are still being captivated by the various forms of the principalities and powers of coloniality up to the present time (Wong 2016a). Paradoxically, a different notion of hope was found when King Nebuchadnezzar destroyed Jerusalem in 586 BC. While Ezekiel was vindicated before his unbelieving compatriots, Ezekiel prophesized for the promise of salvation in a new covenant (Ezekiel Chapter 37). This was however only fulfilled through grace after almost six centuries of waiting, and through the tragic but paradoxically triumphant crucifixion of the Christ. In contrast to the state-centric hope shared among the exiles that the Israeli nationhood would be eventually restored from foreign rule, a radically different vision of de-colonial hope and statehood was conceived by Ezekiel. I discern that the gist of Ezekiel’s vision of the futuristic statehood hinged on the heavenly polity symbolized by the four multi-faced, free-moving and high-flying cherubim as the good angelic powers who were commanded by God as the ultimate sovereign of all worlds. A question is relevant to our present-time here: which are exactly the four evolving earthly powers of coloniality that these four cherubim have been dealing with? As an attempt to explore this futuristic form of de-colonial statehood, this article aims to explore the relevance, implications and possibilities of the ‘Open Science’ movement to the Bandung project. Based on the May 2017 Editors’ conference held by BioMed Central/SpringerOpen of Springer Nature in London, in the first place, it will outline the recent developments in the Open Science movement. I will then reflect upon a question: what are the relevance, implications and future possibilities for the Bandung project? A few directions of exploration will follow. First, I will revisit the unfinished state-building project of the first President of the Indonesian Republic—Soekarno (1945–1967). By offering a rendition of what he tried to achieve through the 1955 Bandung conference, I will suggest that the Open Science movement opens up a new, inclusive and peaceable possibility for us to re-think about the future of statehood for the human mankind. This futuristic statehood is conceived to be inclusive, non-violent and non-hegemonic. I will also stress that in line with the Non-Aligned Movement spirit (Keethaponcalan 2016), it remains essential for the Bandung intellectual project to stay balanced and neutral in relations with the four dominant political types of statehood in our present time: (1) liberal democracy, (2) military dictatorship, (3) religious statehood and (4) statist socialism. Second, by conceptualizing the Open Science as an emerging transnational space for wider knowledge dissemination and global sharing, I will suggest that whilst the Open Science knowledge-space does not necessarily contradict the existing international system of sovereign statehood and transnational capitalism, it actually necessitates the inputs and collaborations from the existing political types and their associated forms of capitalism. Third, by recognizing the essential roles to be played by the State and Capital in generating and maintaining the Open Science transnational knowledge space, I will suggest that a new global knowledge political economy is warranted for nurturing and sustaining an alternative ‘life-world’, which can co-exist with an international system of sovereign states and transnational capitals. To achieve this, I will re-examine the exiled prophet Ezekiel’s theological, geopolitical and anthropological expositions. This is intended to outline a transdisciplinary research and publication agenda for the decolonization project towards the heavenly future of the human mankind. This agenda will neither replace nor surpass any existing research and publication agendas. Rather, it would open new possibilities for diversifying the Bandung project towards the de-colonial brave new world. In April 2017, the news headlines in East Asia were hit by the retraction of a record-breaking 107 published journal articles from the authoritative biomedical journal—Tumor Biology—by Springer Nature.1 It was established that the peer review process of these retracted articles involved fake reviewers. The affected authors were mostly from China. At a similar timing, having a collaborative partnership with the National Natural Science Foundation of China—a functionary of the Chinese State Council, the German Research Foundation (Deutsche Forschungsgemeinschaft) issued a public statement concerning the replicability problem of research results nowadays (Forschungsgemeinschaft 2017). It states that scientific research outputs have already suffered from the ‘replication crisis’ for some times. Worryingly, if the replicability problem continues, the credibility of science will be further weakened (Munafo et al. 2017). It was expressed in the BioMed Central/SpringerOpen Editors’ conference that the above problem does not only exist in particular countries. Misconducts, unethical behaviours, inappropriate and questionable practices are not uncommon in the scientific fields. These would entail the following aspects (Boughton 2017a, b; Fanelli 2009). First, although there was 14% of the scientific practitioners reportedly witnessed their peers in committing misconducts and questionable practices, only 2% of them admitted their research results involved in such unethical practices as data fabrication, data falsification and plagiarism. Although there was 34% of the scientific practitioners admitted inappropriate behaviours, 72% of them had at least once witnessed inappropriate behaviours among his/her peers. Duplicate submission and duplicate publication is also a problem, which constitutes 14.2% of the retractions. Another problem is image manipulation. As it was difficult to gather and establish evidence to prove these misdeeds, the majority of the misconducts and malpractices cannot be successfully filed and investigated. The statistics are just a tip of the iceberg. Second is the authorship manipulation problem. This mostly involves the use of money to exchange for the authorships of published articles. In addition, it also entails the inappropriate practices of ‘gift authorship’ and ‘ghost authorship’. In the former scenario, an article’s authorship would be gifted in exchange for intended intangible objects such as job promotion opportunity. In the latter case, money is paid to a third-party person for writing and adding contents as if the authorship and originality of the article could be un-problematically transferred to the payer. As scientists are highly intelligent white collars who may agilely adapt to changes and reflexively modify their own behavioural patterns, it was difficult to gather evidence to establish allegation of authorship manipulation. Last but not the least, the conflict of interest problem is another issue which is also difficult to initiate investigation. Conflict of interest does not only involve the author(s), but also involve the reviewer and the editor. In general, a conflict of interest entails non-financial and financial aspects. As non-financial interests can be manifested in various intangible forms and invisible ways, it is very difficult to gather evidence and investigate. For instance, it is hard to establish an allegation that a reviewer who may have a competing personal, theoretical and methodological interest when reviewing a piece of work. Even s/he is a peer-competitor in the same research field, it is hard to establish an allegation that one is ‘professionally jealousy’ or of ‘mimetic rivalry’. While an established authority in a field is also prone to the same problem especially when one is anxiously challenged by a new argument and finding, the emerging aspirants in the same field are equally prone to the same dynamics. Although recent organizational studies have made some advances in the presence and use of mimetic pressures in the workplace and institutional settings (Ashworth et al. 2009; Caravella 2011; Frumkin and Galaskiewicz 2004; Grimhed et al. 2006; Handgraaf 2012; Johnston 2013; Keerasuntonpong and Cordery 2016; Marlowe et al. 1996; Samariat 2008), clinically proven and established techniques to effectively investigate a scientist in the university setting who was jealous and anxious in the field and the peer review process is yet developed. Perhaps what we can do in the immediate future is to avoid inviting directly competing peers to be the reviewers. To avoid involving someone’s line manager, institutional superiors and subordinates from the same employing institution in the peer review process is another rule of thumb. As the line manager and subordinate involve asymmetrical power relations, having them to peer-review each other would likely cause positional bias and generate unintended mimetic dynamics. In a similar vein, it would be problematic to uncritically adopt an author’s proposal to include/exclude certain reviewers. I do not incline to invite named reviewers proposed by the authors. In case an author would propose to exclude certain named reviewers, I would request a black-and-white written explanation for our record, and with evidence, if necessary. Thanks to Weber, the culture and practice of scientific realism has gradually dominated the scientific careers. While a number of co-existing scientific agendas jealously compete against each other as the centripetal forces concomitantly squeezing towards an imagined but arbitrarily singular center of ‘excellence’ for positions, grants, publications, resources and prestige in not just the institutions but also the trans-institutional scientific fields, the scientists are bound to generate unceasing mimetic pressures towards their peers and constantly be subject to similar and other kinds of pressures by the others. This is actually our own reality of the modern science nowadays (Wong 2016d). Living in this structural reality, my heart-felt thought is with my colleagues: please take good care of the self and others. Having said that, Weber’s vocational discernment is not unproblematic. He seemed to over-emphasize that the scientists are only bound to ruthlessly outdate and surpass each other in their scientific endeavours. There was a deep-rooted culture of scientific realism and social Darwinism in Weber—the scientists are conceived as atomistic individuals who ferociously compete to stay ahead from each other. This may not be in line with the Open Science ethos. But competition as the essential means and ends for ‘scientific excellence’ is now giving way to the four cornerstone values of scientific credibility: openness, honesty, integrity and transparency (SpotOn, Digital Science, and BioMed Central 2017). Weber’s vocational statement however underscores my deep dilemma for the Bandung project: whilst I aim to promote an inclusive, diverse and peaceable culture pertinent to the ethics of academic pacifism (Wong 2013), as a journal editor and a scientific practitioner operating on the ground-level, we need to be critically realistic. What does this scientific critical realism entail? Though we don’t have to be aggressive and militant, we should neither force our colleagues to follow our own agenda, nor should use one’s position to push away other agendas. The bottom-line is academic freedom—we want to maintain a wealth of competing positions co-existing with each other. As the Bandung project will continue to live with the contentious field of centripetal scientific forces, it is of utmost importance for us to be self-protective and always get prepared in order to devise a range of innovative measures and contingency plans to detect, go with and get the best benefits from the realist-Darwinist dynamics and circumstances generated by the crisscrossing interplays of the other scientists, the administrators, the states and the transnational capitals. In other words, we have to live with them and astutely engage/disengage with/from them strategically, instead of totally rejecting them. In other words, unexpected and undesirable circumstances in scientific endeavours do not only limit and constrain us, one can still choose to go with their flows—circumstances can always be creatively used to re-make possibilities and tap new potentialities to our advantage. These tensions, conflicts and mimetic frictions in the sciences are resultant of the ‘colonization of the life-world’ processes contributed by the two identified imperatives of the sovereign statehood and the global capital market: power and money (Habermas 1987). Though Habermas is not regarded to be a proponent of the de-colonial project, his position equally speaks to the European and non-European subjects, who are commonly captivated by the principalities and powers of the sovereign statehood and transnational capital nowadays. Unsurprisingly, as the German Research Foundation’s April 2017 statement rightly puts (Forschungsgemeinschaft 2017), there are built-in structural and institutional factors perpetuating these tensions and conflicts in the sciences. These are but not limited to: (1) increasingly competitive environment for government-allotted research funding and teaching resources, and (2) mounting publication pressures intensified by inter-institutional competition for world ranking, graduate employability, teaching reputation and scientific prestige which are key performance indicators for state funding allocation. These are the evidence of the colonization of the university life-world. Repairing the damages caused by the present replication crisis would necessitate an innovative approach. This approach should be less to do with how to get rid of these tensions and conflict because they are the natural parts of us and our own institutions. Two relevant arts of governing the self and others for the future may be discerned. First is to ask how to live with these tensions and conflicts. This requires a search for certain ethical anchorage. Second is to ask how to reinvent and sustain a new scientific knowledge landscape so that these less comfortable but enduring aspects of us can be more honestly acknowledged and reconciled in a positive, affirming and inclusive space. I consider this question is very relevant to the future development of the Open Science knowledge space such as the Bandung project. However, as this new emerging knowledge-space may not benefit us in the immediate future because it takes time and dutiful efforts to experiment and develop, we have to remind ourselves constantly that we are actually doing this for our children and future generations—we want them to do better science and surpass us—this is an aspiration of the Bandung project—to have faith in our future generations’ capability to attain peace. If this is what you also share, what our future generations will benefit from is perhaps a new alternative knowledge-space for doing a science which will be (1) open, (2) honest, (3) transparent and (4) with integrity. These four core values will re-define what ‘scientific excellence’ is, at odds with the current prize-snatching, ranking-boosting and competitive ethos that have been driving us towards certain limited version of ‘scientific excellence’. To repair the credibility crisis problem found in the scientific fields, there is a growing consensus among the publishers and journal development editors that we need to re-think what constitute the essence of ‘scientific excellence’. At odds with the competitive ethos of scientific realism which informs the present definition of ‘scientific excellence’, we consider ‘scientific credibility’ should be considered as a more important parameter. The four core cornerstone values of scientific credibility—openness, transparency, honesty and integrity—constitute the moral-ethical foundation of what the Open Science movement is really about. A number of concrete measures are being experimented and developed here (Wong 2017). In the first place, the Open Science movement consists of not just the Open Access publishing mode, but also the Open Data mode of data storage and sharing. These two should go hand in hand. In recent years, for instance, the maturing Open Data platform of Figshare (https://www.figshare.com/) has gained increasing attentions and wider recognitions from major global publishing groups, universities, learnt societies and scientific associations (Hrynaszkiewicz 2016). A number of journals have already partnered with Figshare (Smith 2017). They now request the authors to concomitantly upload and openly share their datasets for their peers and the public to gain free open access and scrutiny (Hrynaszkiewicz 2017). This is intended to enhance the replicability and therefore credibility of the published research results. Secondly, some journals have started to adopt the ‘results-free peer review’ practice (Appleyard and Bal 2017; Else 2016). As journals and authors are either structurally set or institutionally encouraged to increase their journals’ and articles’ citation numbers as a strategy to enhance their impact factors, an unintended consequence in scientific publishing nowadays is the bias towards publishing positive results. Results-free peer review suggests that apart from publishing positive results, negative and null results should also be published (BioMed Central 2016; Button et al. 2016). There are two rationales here. First, negative and null results are also significant research outcomes, though they may not look path-breaking and prize-awarding. The scientific community and the wider public need to know the more complete picture of all results. Second, they also need to know how come there are negative and null results so that we can learn from them and prevent repeating past mistakes. Learning from failure together is a significant, positive and humble scientific endeavor. This is the gist of results-free peer review: as far as a piece of research has accomplished all the necessary procedures and steps to embrace openness, honesty, integrity and transparency, despite that it does not achieve expected outcome, it should still be published and recognized. Publishing negative and null results could also encourage new advancements based on these results. The spirit is this: it is perfectly okay to fail—we want to see how and why a result can bounce back from past failure. Third is the importance of developing Artificial Intelligence (AI) in the scientific publishing process (Marshall 2017). At present, there are already developed computer software to detect overlapping contents and plagiarism in online and institutional databases (Kowalczuk 2017). They have not fully covered all the electronic journal databases, online and printed publications globally. There are also to-be-sanctioned techniques of plagiarism such as plagiarizing unpublished papers and appropriating others’ new unpublished ideas presented in seminars and conferences. Moreover, as different electronic databases are held by competing publishing groups, there are significant legal and commercial obstacles to be removed but this will take time. There is a consensus that in the long run, efforts and resources will be dedicated to develop advanced AI instruments to pre-detect plagiarism and conflict of interest such as mimetic pattern of scientific production. A mimetic pattern of publication refers to a pattern of competitive scientific publishing by the authors who are commonly ‘in the make’ process of self-establishing to be an authority in the field. This pattern of publishing is more concerned with establishing/defending oneself as the authority in relations with the imitated/imitating others than honestly reporting what the findings really are. Normally, the results are prone to over-generalizations and biased theory-building. New AI development is necessary to penetrate existing legal and commercial barriers to intercept existing and emerging forms of plagiarism and inappropriate behaviours. New AI human-to-machine and human-to-human interactive instruments may be developed to detect such emotive tensions as jealousy, anger and anxiety in the peer review, editorial decision-making and publishing processes. The publishers would potentially need to have access to these privy psychological data about the authors, reviewers and journal editors. Fourth, journal impact factor is insufficient to determine the quality of a research output. According to the ‘San Francisco Declaration on Research Assessment’ (http://www.ascb.org/dora/), solely depending on the journal impact factor to evaluate research quality is problematic. This has indirectly caused a range of inappropriate behaviours committed by authors who only aim to publish in journals of high impact factors. These include forms of co-authorship manipulation and the manipulation of the citations and referencing in order to boost one’s citation numbers. Over the years, I am able to identify a practice that some authors strategically co-author with others in order to boost up their own citation numbers. Honestly, I think this can be problematic as seen from the perspectives of data integrity and authorship originality. To address these problems, there is a growing consensus to broaden the definition of ‘impact’, which should include whether a research output is relevant and useful for the public, the practitioners and the policy-makers outside the academia. Moreover, in order for a research output to be impactful among the wider general public, linguistic accessibility and lucidity of the writing is of utmost importance. These indicators of impact would need to be considered when evaluating a research output. Fifth is the plausibility of practicing the open peer review process. Nowadays, the practice of anonymous peer review is widely used. However, in the midst of the intensifying global competition for research funding and publication resources, same-field peer review practice would tend to put the peer reviewer and the author in a positional conflict of interest, thus tempting them to risk one’s reviewer anonymity to undermine or block other’s work to be published (Matthews 2016). Same-field peer review would become a bitter arena of scientific contentions and inter-personal conflicts. In order to avoid these inappropriate behaviours, contentions and conflicts to poison and hinder scientific credibility and progress, it is conceivable to strategically implement open peer review practice. By generating and sustaining an affirming, supportive and inclusive academic culture, we could encourage and facilitate the authors, reviewers and editors to honestly examine and acknowledge their potential intangible conflicts of interest. The gist is this: various positional/methodological/theoretical forms of conflict of interest are not of criminality and should not to be punished. Invisible conflicts of interest can be a natural part of the production of scientific results. An honest acknowledgement of them would help to inform a more comprehensive picture of science as a production process, thus a more credible science can be guaranteed. Suppression of them is not necessary—they are natural parts of science. For example, I am now openly acknowledging my epistemic conflict of interest when writing this article because my positions cannot be detached from my Christian and post-colonial perspectives (Brueggemann 1986). These perspectives are moreover not detached from my institutional context and social relationships as well as commitments. These are my limitations, which are making what I am. Having acknowledging them openly, I am moreover open to the others’ perspectives and their conflicts of interests as well as other possibilities. This can be done without undermining one’s chance of getting published. In contrast, an honest and genuine acknowledgement of conflicting interests should be considered more favourably which would enhance the chance of getting published. In addition, open peer review would also allow the reviewers from the secondary fields and parallel fields to participate in the peer review process. For these peers do not have direct stakes in the same field of contribution concerned, their reviews would possibly be more detached and neutral, thus reliable. Moreover, this would also enhance the radiation of the research results to other fields of interest (Rowles and Cosgrove 2017). The Open Science movement has gradually changed the landscape of science and its flagship institution—the University. Future scientific practitioners will sooner or later recognize that the audience, users and consumers of their research results are actually beyond their scientific peers, but the wider and diverse global public (Wong 2014c). Since the 1990s when the Cold War ended, in the midst of the neoliberal globalization, the research outputs of the scientific practitioners are mostly held accountable by their employing institutions and the research funding agencies. Over the past two decades, gradually, policy-making in the universities has been directly or indirectly guided by the sovereign states and shaped by the transnational capitals operating behind the scene. Higher education has become a national commodity and soft-power instrument reflecting a country’s international prestige and competitiveness, mostly measured by such parameters as universities rankings, journal indexes and frameworks for research and teaching excellence (Wong 2014a, 2016c). These are then translated into the key performance indicators (KPIs) to assess and administrate the performance reviews of the academic administrators and their staffs in the universities. The Open Science movement moreover enables the higher education institutions and scientific practitioners to be not only responsive to these existing parameters, but to make their research results and data openly accessible, available and held accountable by the wider global public and the markets. There seems to be a two-way process of de-professionalization and re-professionalization of science going on. While scientific authority-making is no longer a lone business to be done inside the university, the public and the practitioners would expectedly develop parallel recognition mechanisms to identify, assess and authorize their own scientific authorities in the future. In the midst of this opening-up globalizing trend of the sciences towards the markets, government, transnational capitals and the global public, the demand for openness and transparency as well as credibility of future research results and scientific authorities will be increased. Though we are commonly concerned by the rankings of the universities and journals nowadays, we should also pay attentions to a world ranking speaking to this structural reality of the emerging global knowledge political economy. Yearly, the Publishers Weekly published a global ranking—‘The World’s Largest Book Publishers’ (https://www.publishersweekly.com/pw/by-topic/international/international-book-news/article/71268-the-world-s-52-largest-book-publishers-2016.html). The methodology of the ranking is simple but critical—total capital volumes. The ranking also lists out clearly which the sovereign state(s) of each publishing group is based at, implying the source(s) of their state-backing. Over the years, there have been many attempts of ambitious merge and acquisition of publishing groups in the global financial market conducted by the transnational capitals and governments behind the scene. Springer Science’s 2006 bid for Informa, its 2015 merge with Nature, and Bertelsmann’s recent increased stake in Penguin would just be a few examples.2 These activities could not just happen without the participation of the sovereign states and their investment brokers in the transnational corporations. In recent years, several China-based capital-rich publishing groups have suddenly joined the front ranks of the list. These are important trends to be observed. The strategic collaboration and workings of these transnational capitals and sovereign statehood are evident—their economic and political powers have been shaping and informing the re-structuring of the prestige perceptions and hierarchy of the global scientific publishing industry. On one hand, it seems that the sovereign states and the transnational capitals have controlled the financial powers informing the policy-making authorities that shape scientific and higher education policies. On the other hand, these publishing groups’ constant merge and acquisition have rendered significant consequences in the reordering, reprioritizing and restructuring of scientific prestige, funding agenda and publication policies in various scientific fields, which directly affecting the universities’ daily policy-making and implementation. This will likely be a possible development in the future: if an academic press or a publishing group aims to maintain its global competitiveness in the long run, constantly involving in tactical merging and capital acquisition with other competing publishing groups to keep up the total capital volume profile would be a rule ahead. A publishing group’s total capital volume would also decide one’s bargaining power in its relationship with the states and the market (Wong 2014a). An implication would be this. 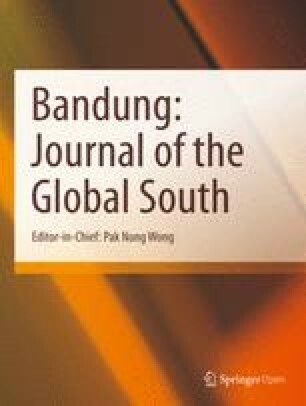 As the scientific prestige structures are subject to the changes triggered by these global structural transformations led by the sovereign states and the transnational capitals, to prevent us from unnecessary disillusionments and disappointments, it is actually more important to identify a long-term anchorage so that an intellectual project like Bandung: Journal of the Global South could persist steadily through these crisscrossing currents of the powers and dynamics of the states and transnational capitals. Scientific prestige can be illusory, though paradoxically necessary (Wong 2014c). This reality is better to be acknowledged and managed sooner than later. As a mere human and institutional construct, scientific prestige is never eternal and therefore temporal by nature. It is also because scientific prestige and esteem are more or less fluid, intersubjective and contextually bound, and therefore are consequential of the politics of recognition and a range of dynamics, which can vary from field to field, from institution to institution, and from circumstance to circumstance (Wong 2016d). Depending on a singular parameter to construct one’s scientific prestige system and to award ‘scientific excellence’ is not only risky, but it will also limit the scope of innovative diversity. The key question is then how to craft an inclusive and diverse Open Science knowledge-space in order to include different scientific prestige systems. To achieve this, we need to revisit Soekarno’s incomplete post-colonial state-building project. After years of nationalist struggles and eventually attaining flag-independence from the Dutch colonial rule in 1949, the first President of Indonesia Soekarno immediately found himself caught in-between the competing forces and powers inside and outside this newly born post-colonial nation. Internally, he had a very challenging time in trying to keep three main centripetal forces—the Indonesian right-wing military, the Islamists and the Communists—together under the newly conceived parliamentary democracy. Externally, he had a challenging time in dealing with the internally generated tensions and external pressures caused by the US-Soviet bipolar rivalry during the Cold War (Wong 2015). Trying hard to keep the US and Soviet encroachments at bay and striving arduously for genuine independence from various forms of neo-colonialism, Soekarno decided to strategically invite the People’s Republic of China to the 1955 Asian-African conference in Bandung. Taking it as an opportunity to break away from the Soviet-US rivalry, Chairman Mao sent Zhou Enlai to Bandung. However, as Beijing’s increasing involvement in the Indonesian communist movement triggered foreign repercussions, Soekarno was eventually not able to save himself from a US-backed military coup in 1967, when general Suharto brought Indonesia onto the path of military rule for more than three decades. Despite Soekarno’s state-building project was incomplete, it still has relevance to the present time. In a post-colonial volatile situation where Soekarno strived to keep the four centripetal forces of liberal democracy, Islamism, Communism and right-wing militarism together in the newly born Indonesian republic, his inclusive ethos can best be characterized by the 1955 African-Asian conference where he managed to gather the leaders of the different political types in Bandung, Indonesia. Recognizing the complex reality that the internal competition and conflict between the four political types intensified in the midst of the foreign great powers’ infiltrations and interferences, the present Bandung project will continue Soekarno’s original vision to keep these competing visions of statehood and their centripetal forces all together within a more encompassing yet to-be-developed form of futuristic power/knowledge spatial statehood. The emergence and construction of the Open Science knowledge-space provides a timely opportunity to revisit Soekarno’s unfinished project and explore new possibilities of a more inclusive and peaceable future for a new form of transnational statehood since the Peace of Westphalia in 1648. To actualize this emerging inclusive form of alternative statehood, my thesis is concerned with the essential linkage between capital and statehood. My key quest is for this new statehood model to accommodate the political projects of liberal democracy, Islamism (and other religious statehood), Communism and right-wing militarism. In line with the Non-Aligned Movement, it is in the interests of the Bandung project to stay neutral in the midst of these four competing political types. In other words, we can facilitate and welcome the dialogues and exchanges with all kinds of statehood, whether they are perceived to be ‘populists’, ‘atheists’, ‘warlords’, ‘totalitarians’, ‘rogue regime’ and what-nots. These labels can be politically motivated which do not really help the development of the Open Science knowledge space across the globe and the Bandung project. The Open Science knowledge space should be an inclusive space which can penetrate political barriers and territorial boundaries. Taking side or identifying with any political type or ideological camp would be counter-productive. Championing the liberal democracy, the Islamic caliphate, commissarial dictatorship, or socialism in the Open Science space would easily attract backfire. These competing forms of statehood emerge and exist resultant of their own context-specific historical trajectories and structural necessities. It is better to debate which one is the necessary model in a specific context than advocating which is the best model out of the context. To take a step backward, from the perspective of the Bandung project, a workable statehood project should be sufficiently assessed by the parameter of social justice—in what ways and to what effectiveness economic wealth can be re-distributed by the state to the deprived and disadvantaged. It can be problematic to debate which one is truly democratic—the metropolitan capitalists, the communist cadres, the militarist generals and the Sharia jurists are all claiming that their own political models are democratic, if not the best—these are dead-end contentions to be avoided. What will be the implications of this emerging Open Science knowledge space for facilitating a new form, structure and contents of alternative spatial statehood for the future? What will be the roles and specific operations that the sovereign statehood and transnational capital playing in this emerging global knowledge political economy? What will be the relationships between the Open Science knowledge space and the competing political types of liberal democracy, statist socialism, religious statehood and militarist rule? How to strike a balance among them? How to deal with their conflicts in managing the Open Science knowledge space? Can the Open Science knowledge political economy work with the various political types? How will their collaboration be possible? To ignite a more constructive discussion ahead, I am going to articulate an alternative form of prophetic statehood familiar with the Abrahamic traditions. Without rejecting any kind of this-worldly sovereign statehood, this form of other-worldly statehood may have instructive implications for sustaining the Open Science knowledge space as an inclusive, diverse and peaceable space in, of and above the existing global system of states and transnational capitals. This is intended to reinvent the ‘life-world’ in this emerging Open Science knowledge-space (Habermas 1987). To Habermas, the life-world should be reinvented through creating an ‘ideal speech community’ for the participants to push back the distorting influences caused by the two imperatives of the state and market; power and money. My thought is this: instead of attempting to push away the state and capital from our lives, it is more feasible for us to finds good ways to live with these two colonialities in the post-colonial era. Therefore, re-developing an alternative rendition of the ‘life-world’ from the original Husserlian conceptualization of the ‘life-world’ in the everyday life sense would be a start. The Open Science life-world however does not limit to the everyday life experience. In an open, honest and genuine ideal communicative situation, one should be ready to reveal and declare one’s faith, especially its teleology. For instance, a socialist has her/his faith in its materialist teleology towards the communist utopia, whereas a Muslim or Christian has her/his faith in eschatology—the second coming of God as their teleology. In short, where does a political community aim to achieve? What is the destiny? What is the ultimate goal? How would one approach this destiny? Specifically, I am interested in what ways and to what extent faith is a conducive ethos to sustain a life-world space to include the four competing political types, which is under the Open Science knowledge-spatial domain. How would this alternative life-world be theologically, geopolitically and anthropologically possible? An exposition of the Israeli Ezekiel’s (622–565 BC) prophetic model would be useful to outline an ethical anchorage for the Open Science. The ancient Babylonian Empire recorded unprecedented achievements in the mathematics, astronomy and calendric science. Being one of the Israelis who was exiled to Babylon, Ezekiel however conceived visions which are relevant to formulate a theological, geopolitical and anthropological exposition for the Open Science. This transdisciplinary exposition is argued to be able to keep the Bandung project neutral and balanced in relations to the competing political types within this emerging global knowledge political economy. My position is this: the four cherubim under God’s command envisioned by Ezekiel represented the good spiritual forces constantly resisting the demonic propensities of the principalities and powers of the four competing political types of our time. In the vision of the Hellenistic Wars conceived by Ezekiel’s contemporary—Daniel—who was exiled to serve the Babylonian and Persian rulers (Daniel Chapter 10), these angelic and demonic powers are constantly engaging in struggles in the spiritual realm. Despite the Open Science knowledge space would be naturally caught in their stormy conflicts, adhering to an anchorage will steer us through the roaring waves of volatility. This anchorage has theological, geopolitical and anthropological underpinnings (Begg 1993). Theologically, Ezekiel’s exiled prophet-hood along the Chebar riverside of the Babylonian Empire provides a relevant ethical anchorage to craft this emerging knowledge-space. Comparing Ezekiel’s theological ethics with such prophetic contemporaries as Jeremiah of Jerusalem and Daniel of Babylon city, Ezekiel’s notion of ‘watchman-ship’ will reveal how Ezekiel’s theology informs a new geopolitics and sociology of this emerging power/knowledge-space as both an opportunity and challenge for repentance, salvation and redemption (Ezekiel 3: 17, Ezekiel 33). The exiled prophet Ezekiel’s God is above all a ‘holy’ being (Ezekiel 36: 23), that is, one who utterly transcends all forms of human comprehension, manipulation, and calculation. God are unconstrained by any human claim, He act for His own purposes for love and salvation (Ezekiel 36: 22). Being a watchman in but not of this emerging Open Science power/knowledge-space would necessitate the prophet’s unfailing repeated efforts to remind his peoples that God cannot be controlled and constrained by any human will and purpose. In terms of geopolitics, Ezekiel articulated the worldview of an international order in which God is the de facto sovereign in command of not just the small power—Israel, but also the ancient great powers of Babylon and Egypt, and even the mysteriously fearful great power of Gog of Magog (Arabic: ya’juju wa ma’juju) (Ezekiel 38: 2–3). Ezekiel’s prophecy neatly connected the human origins of this enduring evil force in the Abrahamic religions (Bible: Genesis 10:2, Koran: 18 Al-Khaf 94), with its eventual release and the doom of the fallen angel-prince, Satan towards the end (Bible: Revelation 20:8; Koran: 21 Al-Anbiya 96–97). The movements and fates of these great, small, angelic and evil powers are under as much God’s control as is the eschatological destiny of Israel. Being a watchman in this global knowledge political economy would mean the person’s constant speech and writing acts to speak of God’s heavenly sovereignty to the global public, practitioners and policy-makers of the great and small powers, and the constant spiritual struggles between good and evil angelic forces, for which our hope is eschatological in nature. A question would be interesting: how is it possible and in what ways for this emerging Open Science knowledge-space to penetrate into the four political types of the present world?—(1) liberal democracy, (2) statist socialism, (3) military dictatorship and (4) religious statehood. A research strategy is to first problematize the hypothetically essential linkage between capital and these seemingly very different political types. Anthropologically, comparing to his two prophetic contemporaries—Jeremiah and Hosea, Ezekiel was constantly guided by the underlying tensions between the dualistic sociological entities of agency and structure. On one hand, Ezekiel advocated individual responsibility (Ezekiel 18: 1–32)—individuals need to be responsible of the consequences of their own behaviours and choices made. Ezekiel’s anthropology stresses on the human agent’s free will and the responsibility to bear the consequences (Ezekiel 3: 16; 33: 7–16). On the other hand, in contrast to the prophets Jeremiah and Hosea who commonly considered Israel had enjoyed a honeymoon period with God (Jeremiah 2: 2–3; Hosea 3: 15), Ezekiel suggested that the relationship between Israel and God was structurally determined by the sinful human nature and the consistently rebellious historical-structural pattern of Israel from God. In the eyes of Ezekiel, the individuals and their statehood were structurally bound to rebel and commit idolatry (Ezekiel 3–10; 19–21 and 34), constituting the persistently negative relationship between the humans and God. The historical reality of the exile to Babylon was a structured result of this negative relationship. Nonetheless, to compensate Ezekiel’s negative anthropology, Ezekiel’s theology already positively emphasized that God were actually beyond and above the international system and were not constrained by the Israeli failure. God enabled his people to repent and return not for their intended benefits and desired outcomes, but to defend the glory of God. Ezekiel’s watchman-ship model therefore warrants a double-edged strategy. While he allows the human agent’s freedom to make personal decision to choose life/light from death/darkness, idolatry is an undisputable historical pattern in the entire course of human development since the fall. In other words, a new form of post-colonial radical conservatism would inform an Open Science watchman-ship model, which entails the watchman as prophetic witness who should be embracing the fact that although we humans can strive to rein in evilness, evil will nonetheless always re-emerge and re-manifest itself in new, surprising forms of innovative misconducts and inventive unethical practices within, among and outside us. In reference with the Anabaptist and Anglican notions of radical discipleship (Stott 2010; Wong 2014b; Yoder 2012), whole-heartedly Open Science watchman-ship is a plausible ethical anchorage—which would necessitate this futuristic Open Science knowledge-space to be eventually held accountable by the heavenly or otherworldly realm in and beyond the Abrahamic religious traditions, which do not necessarily exclude other cultural-religious traditions. The former Anglican Archbishop Rowan Williams (2002–2012) is indeed perceptively correct in pointing out that the ‘higher education is seen as a product to be marketed to consumers’ nowadays (Williams 2017). The discussion above adds that the users of scientific knowledge in the future are extending to the even wider global public, which is very diverse in many aspects. To effectively connect with the diverse global public, Ezekiel’s prophetic model and his vision for an alternative statehood bear significant promises for us to conceive a de-colonial Open Science knowledge-space. To conclude, for positioning the Bandung project in this transnational knowledge space, I would like to acknowledge the relevance of a reading by the former Archbishop Robert Runcie (1980–1991) of the Church of England. When Runcie opened the Centre for the Study of Theology at the University of Essex in the 1980s, he was explicit to suggest to the University of Essex that the Centre was ‘“in but not of” the Empire’ (Runcie 1988: 13, italics original). Whereas Runcie was referring ‘the Empire’ to the University of Essex as an institution, this Empire is not restricted to any institutional form. I consider this balancing act of being ‘in but not of’ any form of the ‘Empire’—the principalities and powers—is very critical for not just the Bandung project, but for the Open Science movement. This ‘in but not of’ ethos of an all-encompassing knowledge space would constantly remind us where we are all eventually committed and held accountable to, thus would prevent us from exclusion and violence. With this inclusive and diversity ethos, now is the right time for us to move forward and together rewrite Max Weber’s seminal ‘Science as a Vocation’ statement into a new page of Open Science as a Vocation for embracing this de-colonial brave new world. Sources: (1) ‘Springer Science & Business Media Launches Bid for Informa.’ The Guardian. 19 October 2006. (2) ‘Nature Magazine Publisher to Merge with Springer Science.’ Reuters. 15 January 2017. (3) ‘Investors Take Fright from Pearson Asset Sale.’ Financial Times. 12 July 2017. I would like to thank the following individuals who gave prompting feedbacks to the previous drafts of this article: Jerry Moye, Gerald Chan, S. I. Keethaponcalan and Rev. Jerome Stanley Francis. I would also like to thank those who upheld silence after receiving the drafts from me. In their silence, I can feel the warmth of the light. Wong, P.N. 2013. Exploring ‘Academic Pacifism’ Through Examining Joshua’s Warfare [從約書亞爭戰事跡探索「學術和平主義」]. Christian Times (http://www.christiantimes.org.hk). Accessed 27 Dec 2013 (In Chinese). Wong, P.N. 2017. 「開放科學」:科研智識領域的範式轉移。 [‘Open Science’: Scientific Knowledge-Space Paradigm Shift]. 信報財經新聞 Hong Kong Economic Journal A21. https://www1.hkej.com/dailynews/articlePrint/id/1592722. (24/25 June 2017).